Many companies face the paradox of wanting to build a delightful product without knowing if people actually want the product until it’s released. Spotify’s vision was to give people the right music at the right time while incentivizing artists by paying them based on number of shares their music received. A tall order, no doubt, when you consider how hard it is to build out such a platform, let alone make it profitable. Yet Spotify defied the odds and grew from zero to over 1 million paying subscribers in the US — a market foreign to Spotify’s native Swedish team and one already teeming with competitors. Source: How Spotify Stays Lean. So how did they develop a product that fulfilled their vision without driving them into bankruptcy? They took an iterative approach combining elements from Lean Startup, Agile, and MVP methodologies. To achieve its current 10 million paying and 24+ million total user base, Spotify set out a basic roadmap of prototyping early and cheaply, launching only when a baseline of quality was met, and then iterating based on user feedback. In this piece, I’ll explain the goals of each stage and how they all contributed to a sustainable product development cycle. Sound familiar? It should. It’s essentially a hybrid process combining practices from Lean Startup and the Agile Methodology. 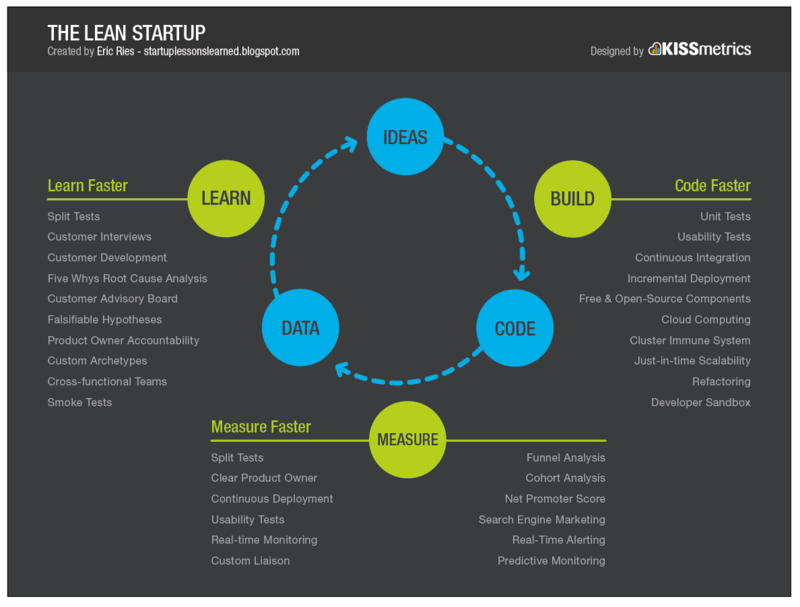 Lean Startup uses a “Build-Measure-Learn” cycle to reduce waste while achieving quality, speed, and customer alignment. At the heart of Lean Startup is the MVP, a quickly and cheaply produced quality product for learning purposes. Therefore, Lean Startup eliminates the idea that a team can build what it “knows” it will need in the future. To that degree, each one of Spotify’s four stages are Lean since small teams are always working smartly to test assumptions. The “Think It” stage tests the merit of conceptual MVPs while the “Build It” stage releases a physical MVP only after it’s been tested for quality. The “Ship It” and “Tweak It” phases ensure long-term quality and customer alignment by releasing the MVP gradually, learning from feedback, and iterating tirelessly. Spotify does deviate slightly from Lean, however, since the “Think It” stage only tests prototypes internally — Lean emphasizes customer testing as often as possible. Source: Entrepreneurs Love to Learn. Lean thinking is necessary in order to develop the mentality needed for Agile practices. 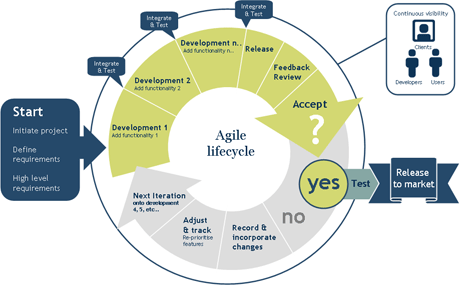 While Lean is used to efficiently define and build a marketable product, Agile is the means to accomplish this in software development. Team members from all disciplines collaborate on short bursts of work (sprints lasting 1-4 weeks), and in doing so, react better to requirements changes. The Spotify strategy stresses this collaboration by preserving the same product team throughout all four stages. These sprints are especially important for keeping resources in check during the “Build It”, “Ship It”, and “Tweak It” phases when all the heavy lifting is done. 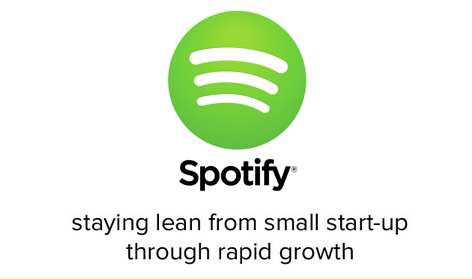 All the testing and validating in each phase also keeps Spotify on the Lean path even if product requirements must be changed to reflect customer and market needs. Before committing resources to a project, companies need to evaluate the viability of the idea. The “Think It” stage consists of small teams asking themselves “Why?” rather than just “How?” At Spotify, this phase is the conceptual stage of the MVP since viability is assessed and minimalist solutions like landing pages and prototypes are used to test user demand. Source: How Spotify Builds Products. According to Christina Wodtke, former General Manager at Zynga, the importance of looking at viability through a business lens can’t be stressed enough. For many companies, it can be tempting to build the perfect viable product simply because they have the resources to do so. By prioritizing viability, Spotify ensures it won’t even waste time and money assigning an MVP team if the overall idea isn’t profitable. Who will benefit from this and how? How will we know if this product is successful? Is this a “step change” (a product yielding at least a 2x improvement on the chosen metric)? If only minor metrics improvements are expected, another strong strategic reason should exist. The goal here isn’t to outline features or technical requirements but to create a data-focused value proposition. The heart of the product definition is narrative. And the story told by product is what the first iteration of the MVP will test. Matchist.com cofounder, Stella Fayman, aptly states the goal of an MVP is to prove that people will use your product. Landing pages and paid ads are a great low-cost way to gauge interest because you test the basic value proposition first (or narrative, in the case of Spotify) before sinking money into anything. This is precisely what Spotify does. When developing its Mobile Free Radio (one version being “Radio you can save”), Spotify ran a Google Adwords campaign to test narratives. In doing so, Spotify exemplifies applying minimalism towards an MVP. Once the messaging is finalized through testing, the Think It team builds low-fidelity paper prototypes and high-fidelity runnable prototypes (with fake data). Internal user testing provides feedback on which prototypes best convey the narrative until the list is narrowed down to just a few contenders. David Aycan, Design Director at the esteemed design and consultancy firm IDEO, explains that multiple prototyping avoids tunnel vision. Ideating on different user experiences puts your eggs in different baskets (preventing over-attachment) and finds the best solution through real data instead of trying to predict what users want. Testing multiple prototypes lets Spotify find the most viable MVP by focusing on breadth rather than depth. Source: Don’t Let The Minimum Win Over Viable, HBR Blog. In UXPin, we can turn wireframes into prototypes rather quickly in our web app. We take a similar iterative approach to Spotify by starting out with several lightweight, even low-fidelity, prototypes and narrowing down the options from there. However, we like to involve a small subset of friends and customers in the prototype testing (unlike Spotify which just keeps it internal) since they help us “think outside the building.” Ultimately this keeps our team centered on a good customer solution instead of just a technical marvel. Spotify, on the other hand, will only move forward if it can match the right prototype to the narrative. Because it only involves prototyping and experimenting, the Think It stage is the essence of MVP thinking — the team fails quickly and cheaply, and keeps learning until they find the exact product to build. Now that a product is decided, the team moves beyond testing concepts to creating a physical MVP that is good enough to release to external users and test assumptions. The right balance of minimalism and quality must be struck with the physical MVP. Building a feature-complete product requires too much time and money, but rushing a feature-poor product out the door would embarrass Spotify and yield no useful learnings. As such, the team must create the smallest possible thing of quality that still fulfills the narrative and delights users. Deep — Great products have just the right level of functionality and don’t become useless after just a few weeks. Intelligent — Great products map specific solutions to pain points (and make customers aware of problems they didn’t even know they had). Complete — Great products are completely usable, even in early stages. Empowering — Great products incite users to action and encourages them to spread the news to help others. Elegant — Great products have intuitive user interfaces and work the way people think they should. MVP narrative-complete and not feature-complete, Spotify is able to inherently satisfy all five qualities for a desirable and usable MVP. Perhaps, a better term for Spotify’s MVP would be MLP (Minimum Loveable Product). Source: The cake model of product planning. The purpose of the Ship It stage is to gradually roll out the product to all users while measuring and ensuring that the product fulfills its promise in the real market. Spotify starts by releasing to a small percentage of all users (usually 1-5%) to collect early feedback. During this stage, the hypotheses that were internally tested during the Think It stage are now externally validated. As you’ll see in the above illustration, the beauty of this stage is that Spotify doesn’t need to get it right on the first try. Collecting data, iterating the MVP, and then A/B testing the changes allows for continuous rounds of maximized learning at minimized cost. Releasing an MVP early and to a small user base allows Spotify to iterate until it becomes an EVP (Exceptional Viable Product) that is ready for all users. 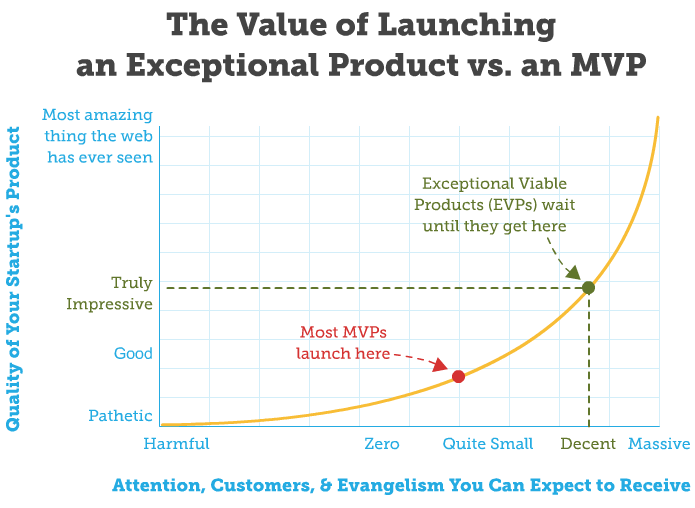 First coined by Rand Fishkin, co-founder of Moz, the EVP prevents companies from prematurely releasing an MVP that just isn’t ready to excite early adopters. Spotify understands that first impressions matter a lot, so it takes a cautious approach of having a limited release of something good before making it great and unleashing their brilliance. Based on the below diagram, Spotify releases its MVP somewhere between “Good” and “Truly Impressive” and then uses customer feedback to improve it into an EVP. Source: Moz, “7 unlikely recommendations for startups & entrepreneurs”. When management and the product team agree that the product is having the intended impact on the small user group (based on the product definition), Spotify will gradually roll it out to all users, while still measuring and improving. At Spotify, this stage is the longest, and perhaps most important. Unless products get scrapped during the previous MVP stages, they spend most of their life in this completely iterative phase. While they may have proven themselves to a certain extent in the Ship It stage, Spotify’s products are never considered feature-complete. The team continues the Ship It process of gathering customer feedback, experimenting, and A/B testing to improve the product, resulting in either major rework or just minor tweaks. But, at some point soon, they may reach a point of diminishing returns when the cost versus benefits of new features just looks less and less attractive. As demonstrated in this article on value vs. complexity, this is an important crossroad where feature prioritization is required. While Spotify believes that no product is truly complete, it also understands the danger of feature creep. 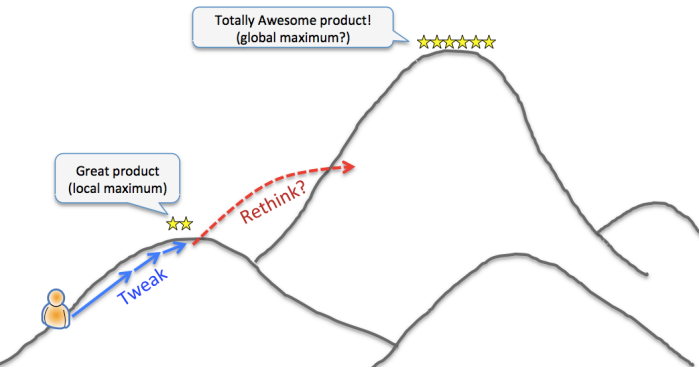 Once a product hits its “local maximum” where small tweaks won’t really improve things, Spotify’s product team and management evaluates if being at the top of the hill is sufficient, or if a higher peak is in sight. If the effort isn’t worth the time, the team will move on to other products. Otherwise, the product returns to the “Think It” stage so it can be reworked and leap to the next peak of quality. Spotify’s Tweak It stage ensures that it does not fall victim to the idea that first to market will always stay king of the hill. Gerard J. Tellis, a professor at USC Business School, believes that product quality has become so important in recent years that network effects alone will no longer protect companies who are first-to-market. In fact, network effects actually reinforces competition for quality by driving customers to superior products. According to Tellis, the average duration for market leadership in the software industry was only about 3.8 years. When you consider that Spotify is slowly inching towards iTune’s market share as of 2014, Spotify’s evolutionary product strategy is definitely working. For many companies, one of the most dangerous mistakes is building the wrong product. They sink enormous cost into ideas that they think customers want and then speed down the path of no return. As you’ve seen, Spotify’s 4-stage product cycle helps them carefully find the right product early and build it quickly and sufficiently. The length of each stage may differ, but the constant balance between minimizing resources and maximizing product quality is consistent. Ultimately, it leads to a lower cost, lower risk, higher quality product. We hope Spotify’s strategy has helped you better understand the roles that Lean, Agile, and MVP thinking play towards streamlining your own product development. Don’t be afraid to fail fast and quickly — as long as you keep testing, your most profitable idea might just come from what you learn.